Cheers! Happy New Year! 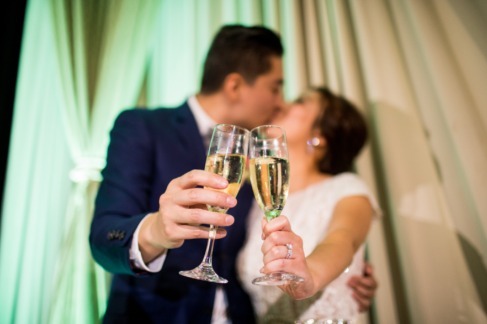 How sweet is this picture of our newlyweds toasting to their happily ever after? 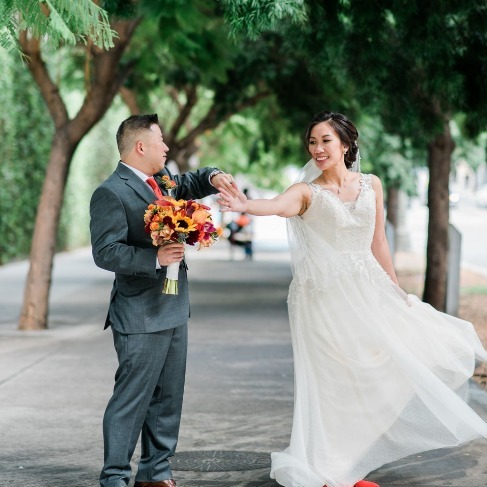 Cakes & Desserts: Half Baked Co.
Our groom hand-painted his bride's tea-length dress, creating a unique, beautiful look for their artistic vow renewal. 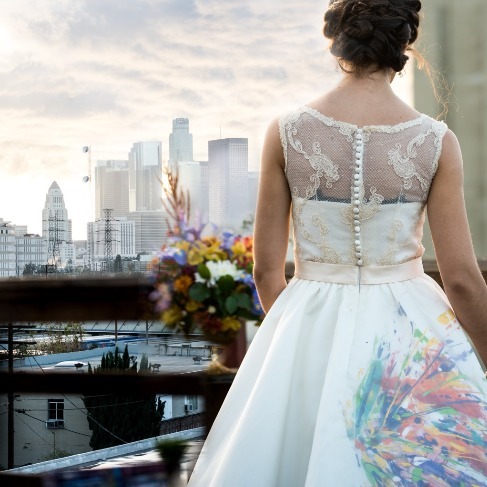 This abstract-art inspired vow renewal's design was heavily influenced by our artist groom's paintings. 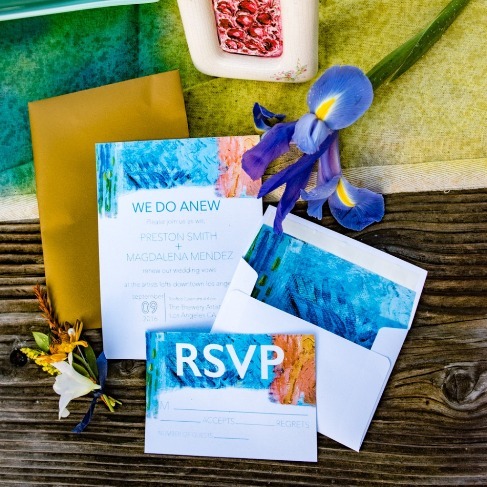 The bold colors he used in his abstract art can be seen in their beautiful invitation suite here. 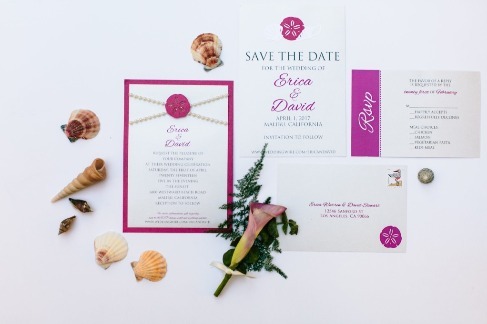 This beach-inspired invitation suite featured string pearls and beautiful cut outs of sand dollars and shells, to add a touch of the ocean while keeping the invitations simple and classy. 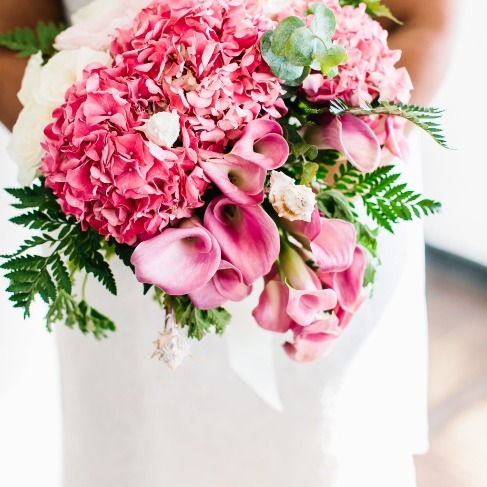 Our bride's wedding was in the beginning of spring on a perfect day at the beach, and this beautiful white and fuchsia bouquet really popped with color when she held it walking down the aisle. 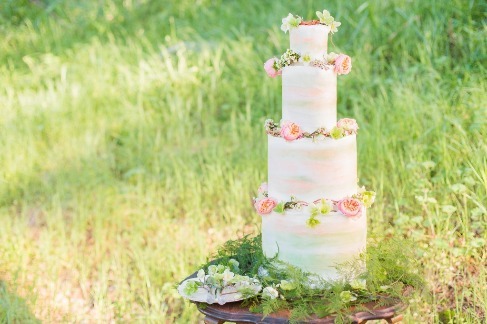 Our couple wanted to do something different for their wedding cake, and that's what they got! 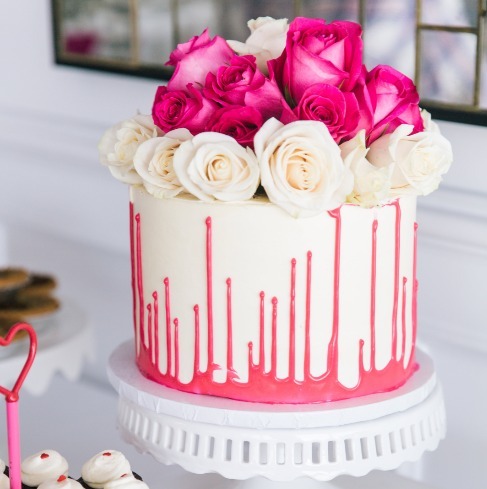 This upside-down drip cake was gorgeous! 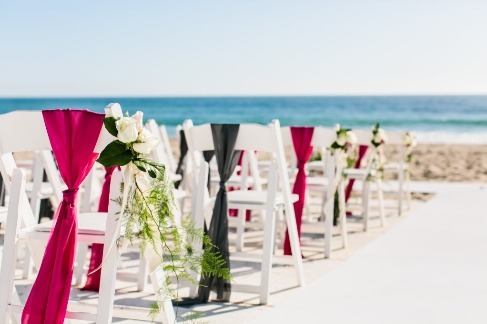 These beautiful fuchsia and grey chiffon sashes were draped on the chairs of this outdoor beach wedding ceremony to add a pop of color, and it tied in perfectly with the serene ocean backdrop. 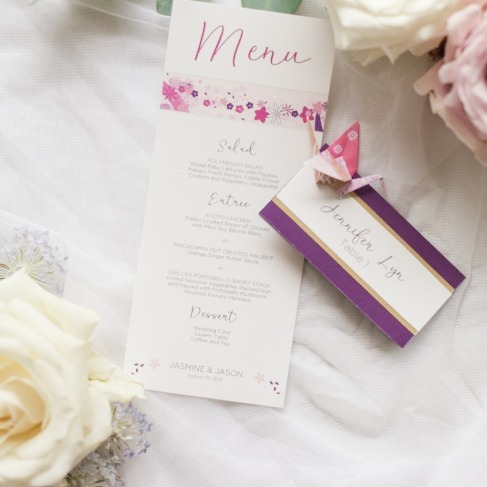 We're in love with these menu cards and placecards, designed to match the wedding invitation suite. Every placecard also had a hand-folded paper crane, making it a little extra special. Looking for something different in your wedding cake? 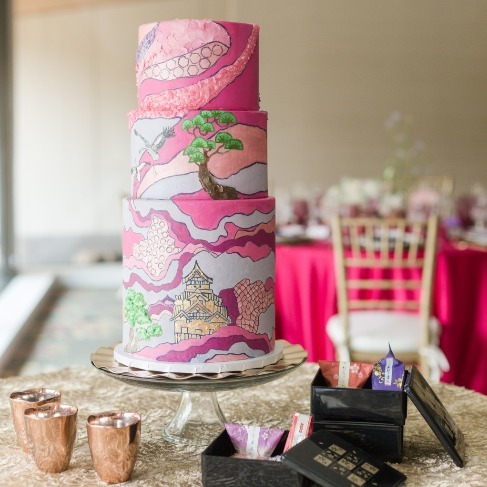 This beautiful cake was painted with abstract art to bring in touches of the couple's Japanese culture. 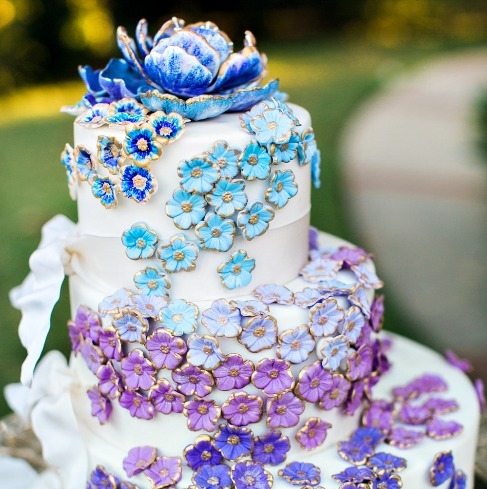 We love the pop of color and the unique twist on a traditional wedding cake. 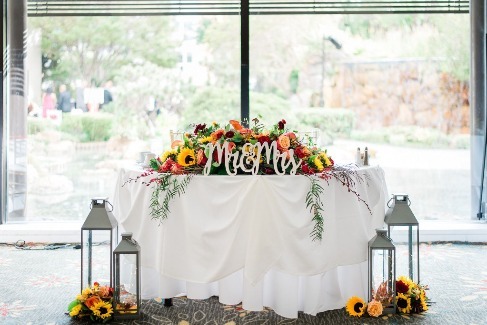 Want to add a pop of color to your tablescape? Do it with your napkins! 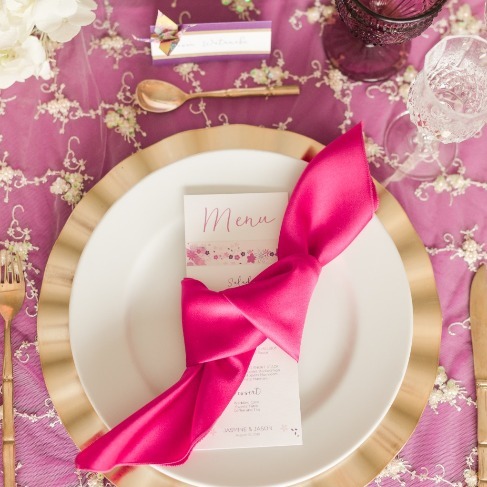 We love this bright fuchsia napkin tied around the menu card. Looking for a special treat for your guests to take home? 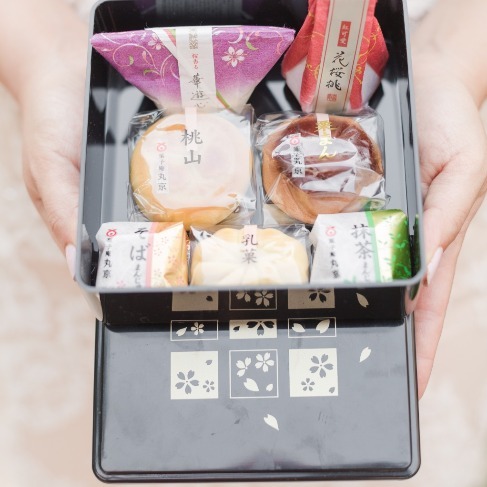 These favor boxes were inspired by traditional Japanese wagashi, and any guest would be happy to bring home a beautiful box of delectable desserts! 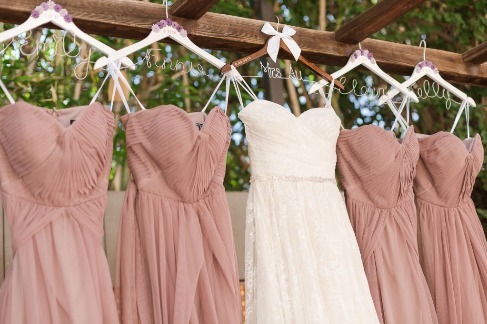 Want something different for your ceremony backdrop? What about a beautiful round floral arch with hand-folded paper cranes hanging from it? 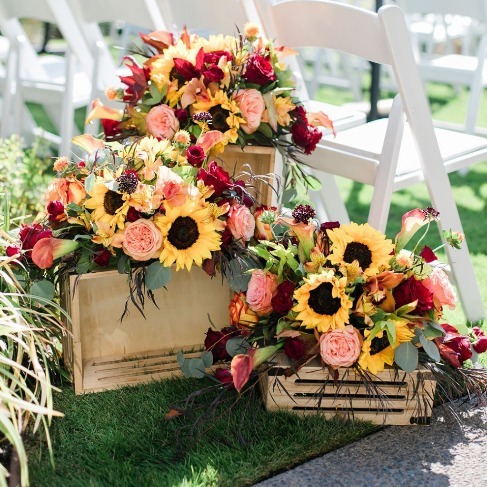 All of your guests will appreciate the details and time put into creating your decor! 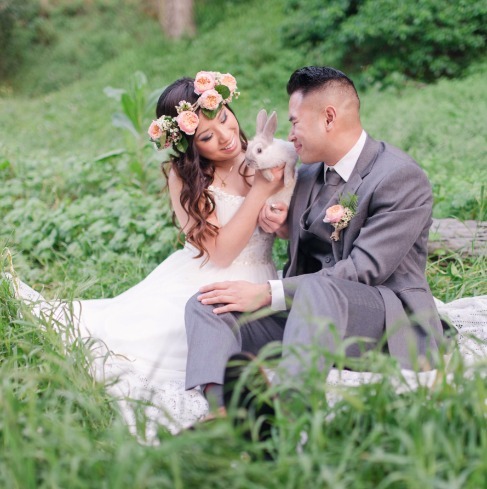 Every couple needs the chance kick back and share some alone time on their special day. 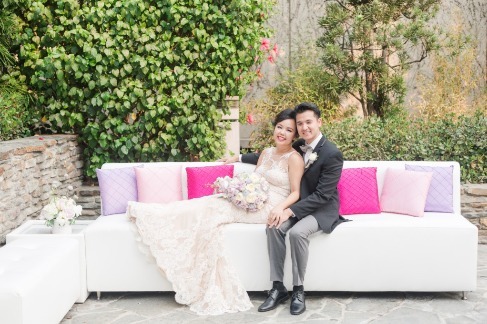 This beautiful lounge set up with cushions that coordinated with the wedding colors made for a perfect cocktail spot to relax! 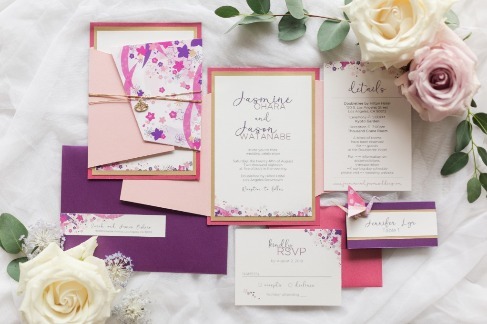 We're still swooning over the details of this beautiful invitation suite! 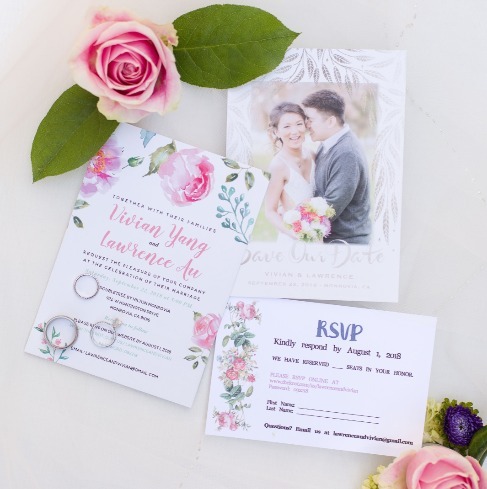 It features beautiful custom washi paper cut as an asymmetrical wrapper, and multiple layers of colored backing. There's even hand-folded paper cranes attached to each and every place card! Want to do more dessert than just wedding cake? 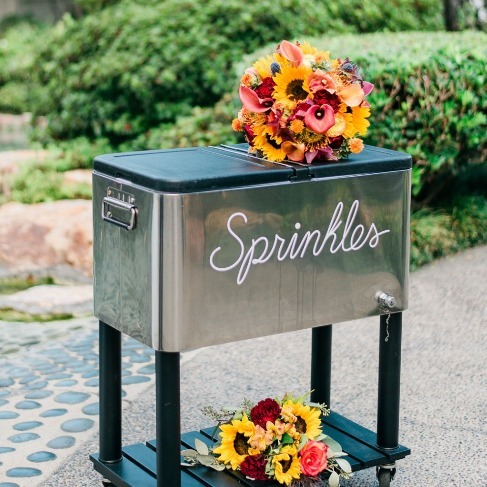 Our couple brought in Sprinkles for custom made sundaes with cookies and cupcakes, and it was a hit with all of the guests! 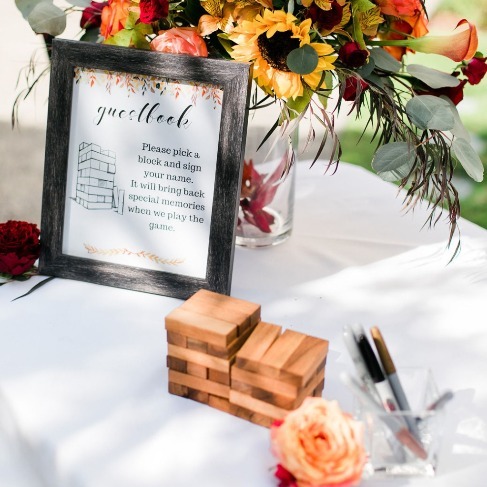 Looking for some unique ways to do a guestbook? Our creative couple decided to let their guests sign jenga blocks! Now they can read the messages and look back on their special day every time they bring the game out to play. 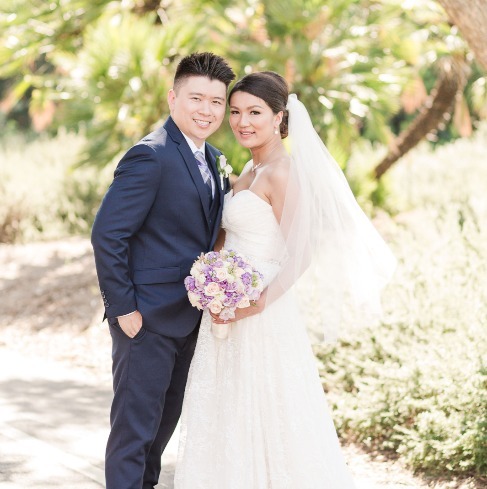 Our couple wanted to keep their cake simple and elegant! 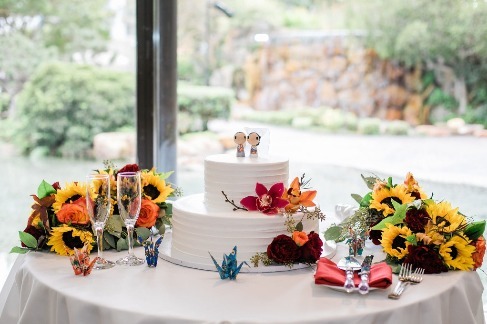 They ordered custom hand-painted peg doll cake toppers to represent their colleges and decorated their cake table with bright florals and hand-folded paper cranes. 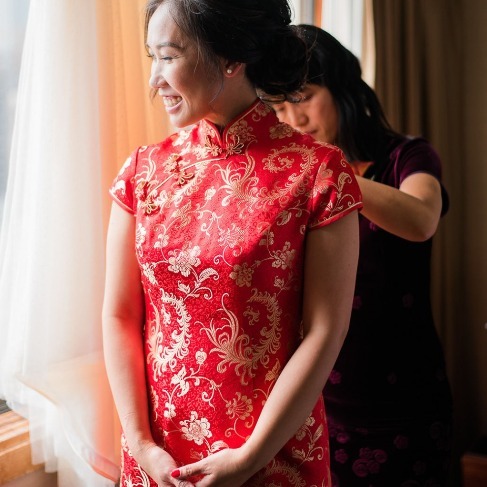 How gorgeous is our bride in her qipao? We can't stop admiring the beautiful, vibrant, red and gold brocade, with its gold details and embellishments. The Lunar New Year has begun! How did everyone celebrate this past week? 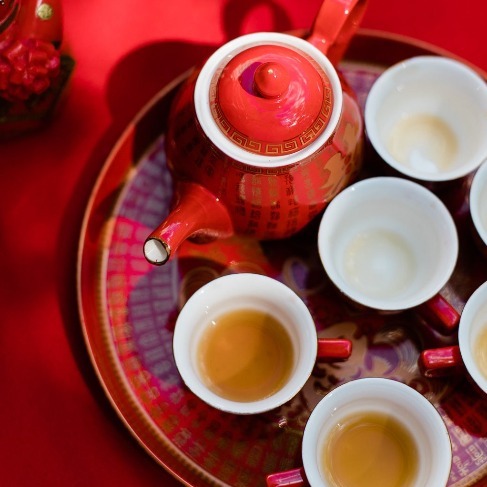 One tradition of Chinese cultures includes hosting a tea ceremony before the couple gets married. 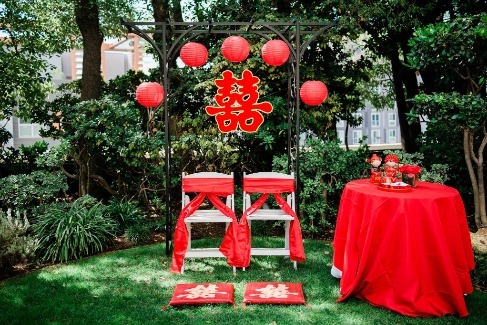 This beautiful set up was done in the Kyoto Gardens at the DoubleTree by Hilton Los Angeles Downtown. 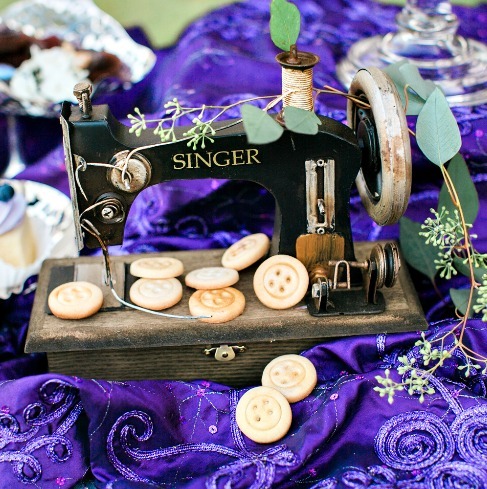 What are some cultural traditions you would like to include into your wedding? Our couple had a traditional tea ceremony, which is a way for the bride and groom to pay respect to their parents and elders as they receive blessings in return. 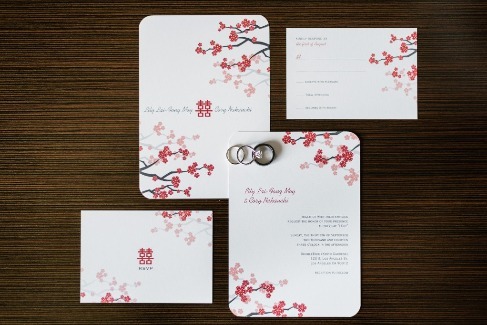 Our bride wanted to incorporate the double happiness symbol to represent her culture in the invitation, and we love the way it turned out! This beautiful rooftop Japanese Garden is tucked away on top of the DoubleTree by Hilton Los Angeles Downtown. 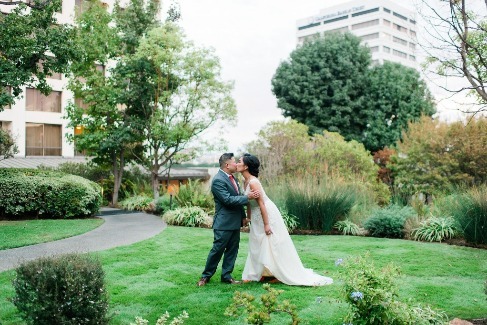 It creates a gorgeous green setting for our couples who are looking for something serene. 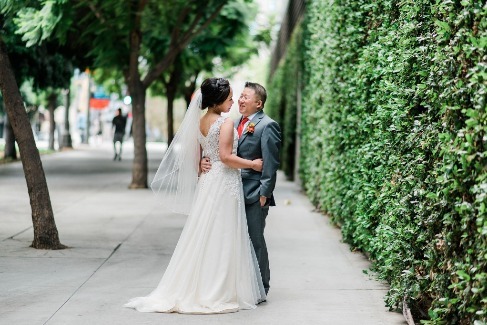 We love the urban look and feel we're getting in this photo from this living green wall backdrop that was picture perfect for our couple's downtown wedding. 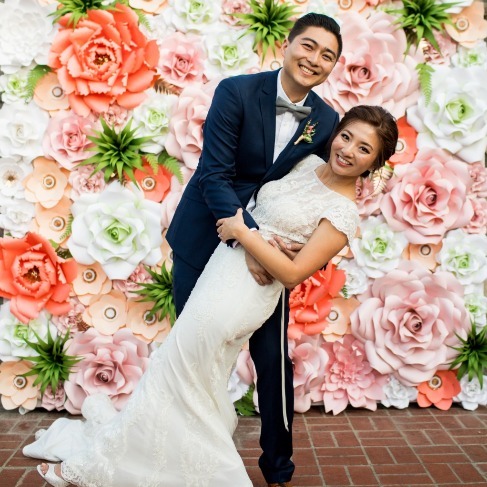 We're still swooning over this beautiful handmade paper flower wall from Paper Mint Lamb that made a perfect photo backdrop during cocktail hour for our couple and all of their guests! 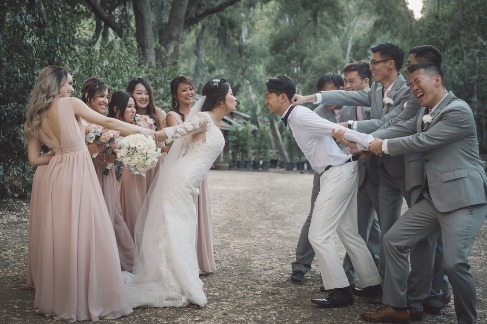 What type of unity ritual would you add to your ceremony? 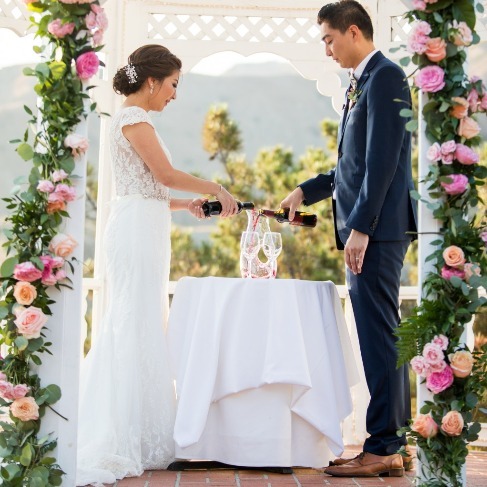 Our couple chose to do a wine ceremony to blend their two lives into one - a beautiful way to symbolize two people coming together to share one life, one love! We can't get over the perfect views you can get from Castaway Burbank! It was a beautiful day for our couple's wedding. Our bride is ready for her big day! 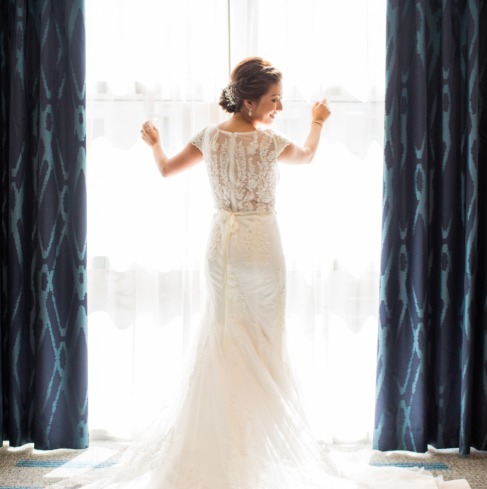 How gorgeous and elegant is this shot by Nathan Nowack Photography? 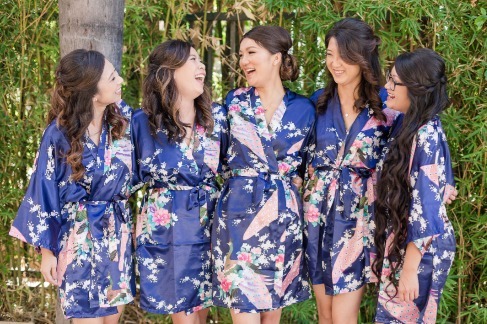 We love happy moments shared between a bride and her bridal party! 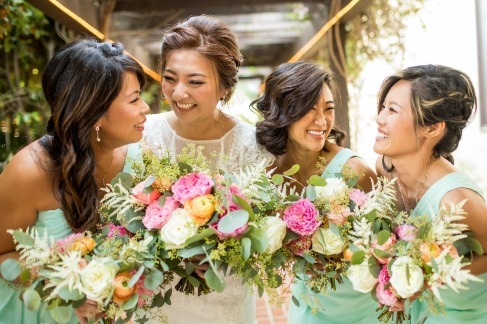 And the bright beautiful colors in their bouquets compliment the bridal party dresses perfectly! 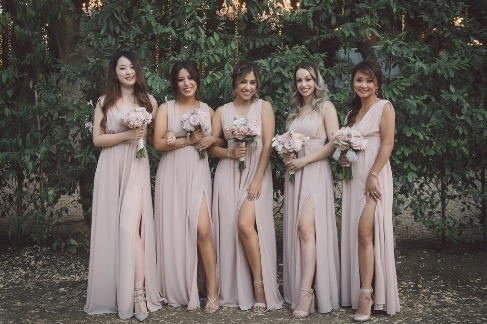 How gorgeous does this bridal party look in a dusty shade of blush pink? 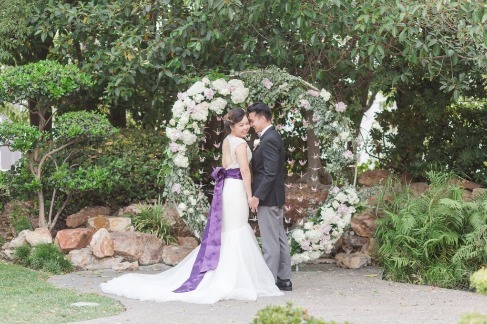 The soft colors add some charm and romance and look beautiful in contrast to the natural green backdrop behind them. Wedding Tip: Having your photographer take formal portraits is always a must, but don't forget to pose for some fun pictures! Looking back, it'll be great to remember some of the silly moments you shared on your special day. 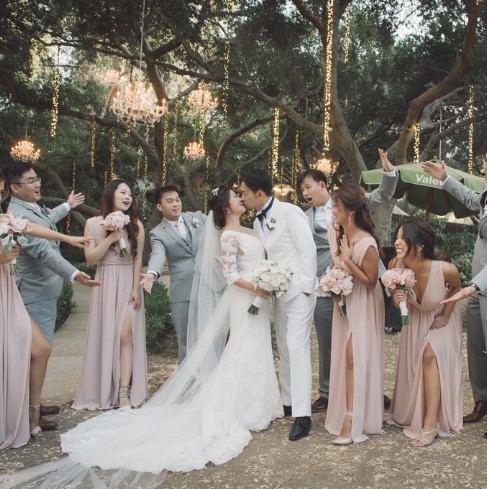 This picture of the bride and groom with their wedding entourage is nothing short of perfection! 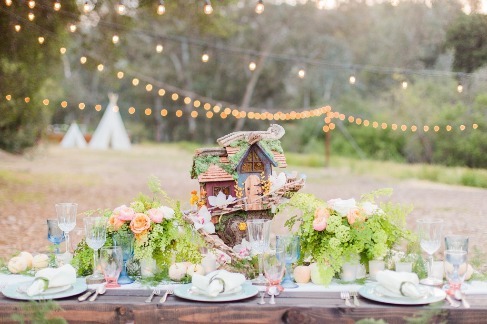 It's perfectly dreamy, romantic, and sweet, and just look at that backdrop! 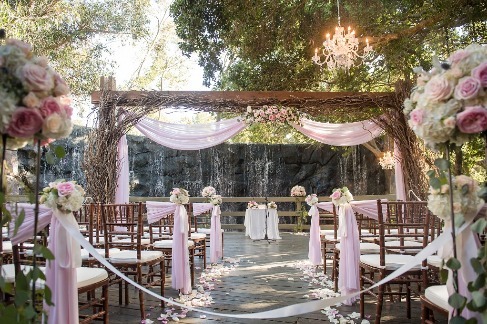 How romantic is this ceremony location? 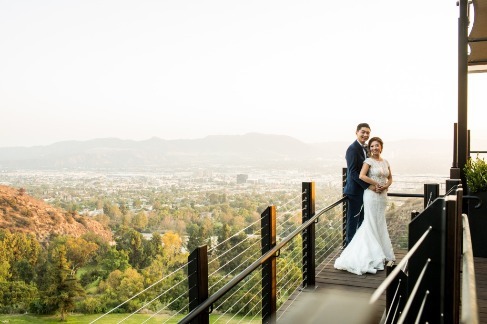 We love the waterfall in the background and the beautiful wooden arch that blends together all of the natural elements in the venue. 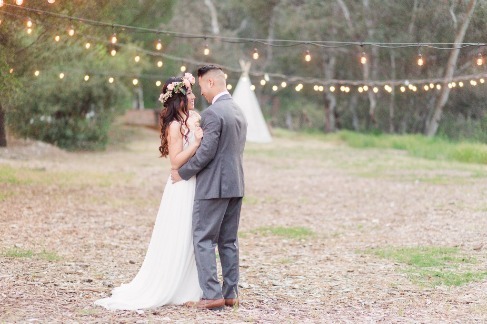 The scene was set perfectly here at Calamigos Ranch with the beautiful trees, twinkle lights, and chandeliers. 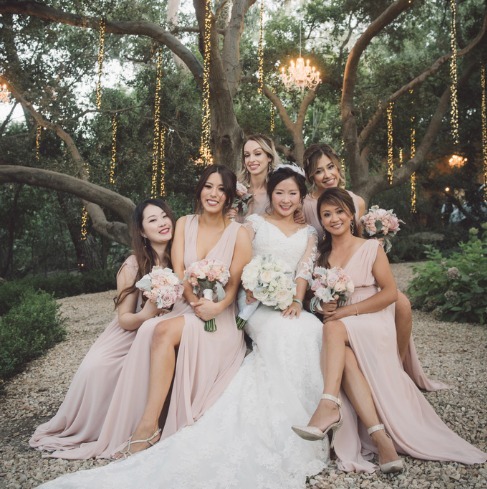 Our beautiful bride with her bridal party in blush pink fit in perfectly with the romantic backdrop. 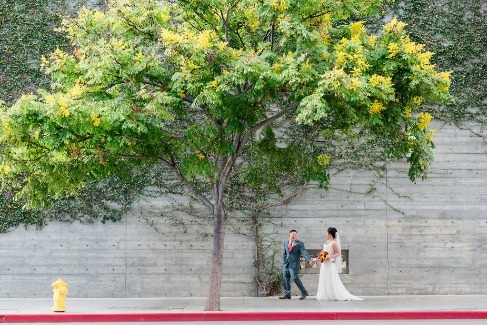 Using the natural elements found at a venue can sometimes make for beautiful backdrops. 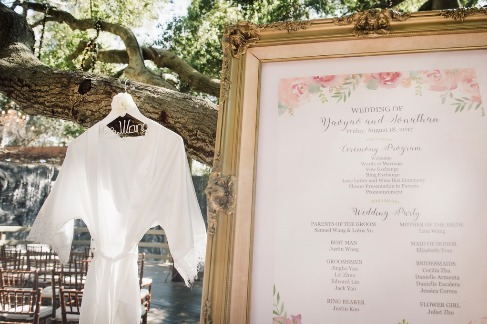 We used this gorgeous tree to hold up our bride's robe and to prop up the vintage-framed wedding program for a perfectly styled photograph. 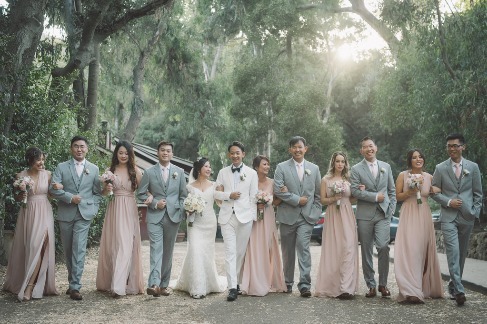 This shot is perfectly dreamy with the bridal party in blush pink and groomsmen in light grey. 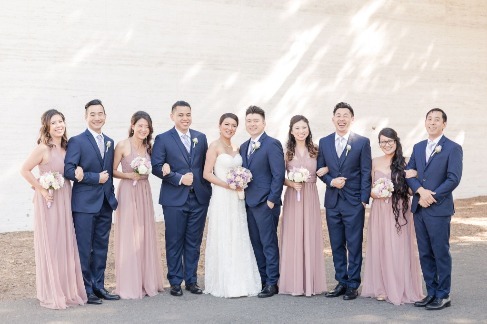 The colors complemented each other beautifully and our bride and groom look perfect in all white!